Your one stop online store for healthy products. We also provides healthy recipe and fitness tips. Everybody want to have a trimmed body figure and want to stay healthy. 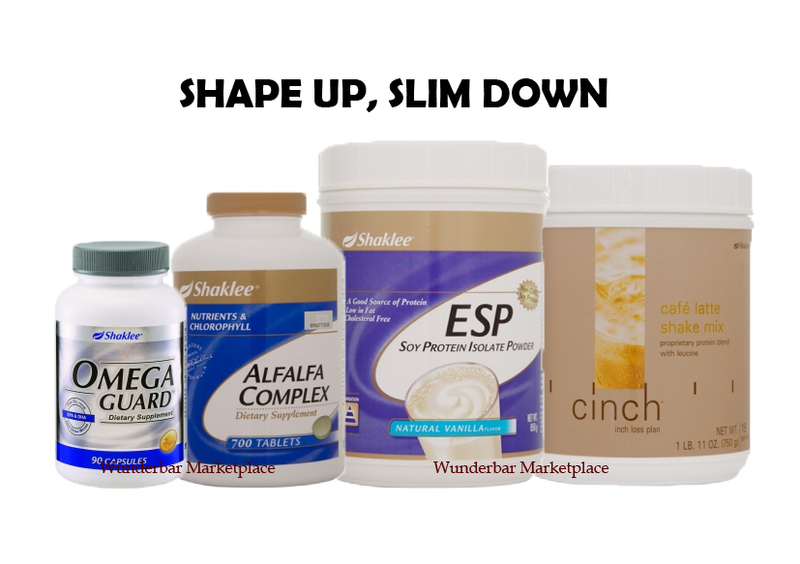 With Shaklee shape up, slim down set, you only have one thing to lose…IT IS FAT!!! Docosahexaenoic acid (DHA) and Eicosapentaenoicacid (EPA) are omega-3 fatty acids found in deep-sea cold water fish. DHA and EPA are known to reduce inflammation, promote proper brain, nervous system, and eye function and must be obtained through the diet. Shaklee OmegaGuard™ is a dietary supplement containing fish oil. One serving of OmegaGuard™ provides 1000mg of omega-3 fatty acids including DHA and EPA. Alfalfa is a storehouse of nutrients. Its tap root reaches down as deep as six meters, searching out nutrients and minerals from deposits in the soil, while its leaves gather large amounts of chlorophyll through the natural process of photosynthesis. Alfalfa contains vitamins A, C and E as well as calcium, potassium, phosphorus and iron. Alfalfa Complex is a Shaklee Signature Formula originally developed by Dr. Shaklee in the 1950s. Tablets may be crushed and added to boiling water for a natural herbal drink. This product contains Alfalfa (Medicago sativa). Individuals with a predisposition to systemic lupus erythematosus should consult their physician before consuming this product. If you are pregnant or nursing, ask kindly consult your health care professional. Cinch® Shakes are a great tasting, nutritious way to help retain that all important muscle and keep you feeling full and satisfied while you lose weight. Powered by Leucine™ to preserve muscle while you lose weight. Loads of protein to help you feel satisfied and full. High in fiber, with six grams per serving. Shaklee ESP powder is a good source of soy protein. ESP provides 14 grams of high quality non-GMO soy protein with all the amino acids, including the nine essential amino acids your body needs for protein synthesis. Unlike protein from meat, eggs and dairy, ESP is naturally low in fat. It is also lactose and cholesterol free. Provides sustained energy and helps ward off hunger because it provides a constant source of energy. Soy protein helps to reduce cholesterol. This non-GMO soy protein is produced under an Identity Preservation Program (IPP), which means that the soybeans are tightly monitored and controlled from planting through processing. You are what you eat, this is only for suggestion. You can buy according to your needs. Contact me ASAP for discount price.